A worsening global economy stifled demand for products in the Republic's biggest export markets, leaving Singapore's exporters struggling in choppy waters. Non-oil domestic exports (Nodx) plunged 10.6 per cent last month from a year earlier, prompting economists to warn of a difficult period for Singapore's economy in the months ahead. The breadth of the decline made the poor showing even more worrying. Shipments to all top 10 markets tumbled, save for the European Union, which posted a 3 per cent year- on-year rise. Even economists were taken by surprise as a Bloomberg consensus estimate had projected a fall of just 2.5 per cent. "The writing is on the wall. For those maintaining a sanguine view of the near-term outlook on the economy, this should be a wake-up call," warned DBS senior economist Irvin Seah. He noted that economic growth figures across the region were being dialled down, posing a threat to Singapore's own growth forecast, which stands at between 1 per cent and 2 per cent for the full year. Yesterday's trade data from IE Singapore bore this out. Apart from sharp declines in Nodx to the United States and China, shipments to Indonesia and Malaysia - economies that have been growing - also sank. And this was no blip. Trade across Asia has been continuously contracting over the past year, a trend not seen since the global financial crisis, said ANZ economist Ng Weiwen. He noted: "This is not peculiar to Singapore. The region as a whole seems to be looking at a rather protracted trade recession lasting longer than the Asian financial crisis in 1997, the dot.com crisis in 2000 and the global financial crisis in 2008." Electronic exports fell 12.9 per cent from July last year, mainly due to fewer shipments of PCs, parts of integrated circuits, and diodes and transistors. Non-electronic exports declined 9.5 per cent, led by a drop in sales of petrochemicals, civil engineering equipment and specialised machinery. Singapore's total trade fell 11.1 per cent last month in nominal terms from a year earlier, after declining 5.1 per cent in June. 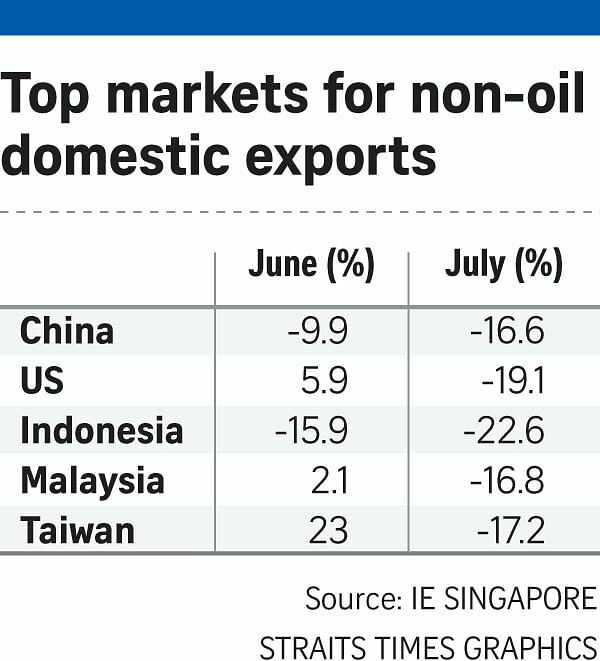 IE Singapore expects total trade to come in at minus 7 per cent to minus 6 per cent this year. But some economists are not yet giving up hope and believe things could still turn around. Some are pinning their hopes on how the manufacturing sector performs in the next few months. UOB economist Francis Tan noted that the Baltic Dry Index, a key barometer of shipping, has risen 136 per cent from February to last month, indicating that trade may be picking up again. Mr James Wong, managing director of hydraulic cylinder maker OE Manufacturing, noted that sales have slowed this year. Exports to Japan, the US, Korea and China account for about half of the company's revenue. "Both domestic and export markets have not been performing well, and we don't think this will improve in the second half of this year," he said.